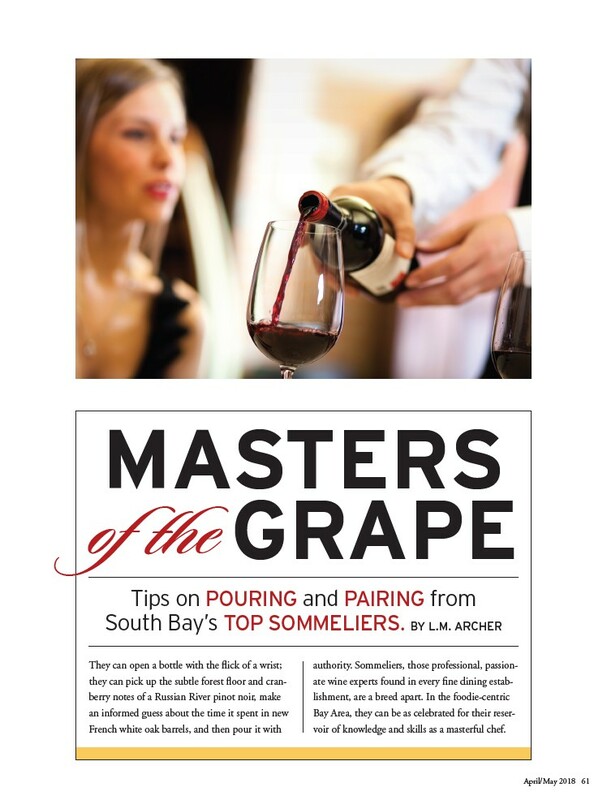 April/May 2018 61 MASTERS of theGRAPE Tips on POURING and PAIRING from South Bay’s TOP SOMMELIERS. BY L.M. ARCHER They can open a bottle with the flick of a wrist; they can pick up the subtle forest floor and cranberry notes of a Russian River pinot noir, make an informed guess about the time it spent in new French white oak barrels, and then pour it with authority. Sommeliers, those professional, passionate wine experts found in every fine dining establishment, are a breed apart. In the foodie-centric Bay Area, they can be as celebrated for their reservoir of knowledge and skills as a masterful chef.